The first numbers are in and Apple did pretty good with their iPad on launch day. 300,000 units sold is the official raw number that came out of Cupertino this morning. This number is tallied from pre-order deliveries to the Apple store and retail sales at Apple Store. The figures only show sales through Midnight on Saturday, but some analyst think that number is actually bigger, maybe more than 500,000, but nobody knows for sure. 300,000 is a massive number, and remember this was only a U.S launch and only the wifi models we sold on day one. People a lot are holding out for the 3G model, to come later this month. By contrast, Apple sold roughly 270,000 iPhones during the opening 30 hours on the market in 2007. But the iPhone 3Gs did considerably better, selling over a million units in its first weekend. So if you think about Apple did pretty good, that’s roughly about $150 million if you use the low-end model (300,00 x $500). This isn’t the only nubers that Apple released. 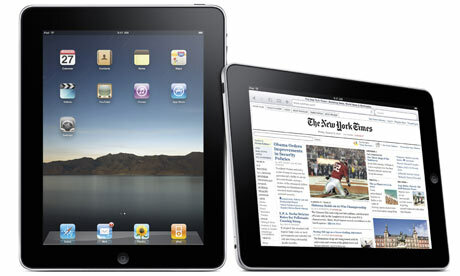 Apple also said iPad users downloaded more than 1 million apps and more than 250,000 e-books through iTunes. It breaks down that the average iPad owner downloaded more than three apps and close to one book within hours of opening and unpacking their new iPad. The most popular apps came out of the Productivity category with the Pages word processing app, being the number one iPad app so far. Scrabble came in at number six and was the most popular iPad game so far. All and all it wasn’t that bad of a day for Apple, I’m sure the number will double with release of the 3G model and it could really get big when Apple releases it internationally. We will have to wait and see. You can read the official Apple press release here. iPad is Live, So What Now? Argghh! Cant wait o get my hands on one, come on Apple!